1872 (August 15): Aurobindo Ghose was born in Calcutta, India. 1878 (February 21): Mirra Alfassa was born in Paris. 1879: Aurobindo was taken to England along with his brothers; he lived in Manchester with an English family for five years. 1884: Aurobindo was enrolled in St. Paul’s School, London. 1889 (December): Aurobindo won a Classics scholarship to attend Kings College, Cambridge; in June 1890 he passed the Indian Civil Service (ICS) entrance examination; he attended Cambridge as an ICS probationer until 1892. 1892: Aurobindo passed his final Classics and ICS examinations but was rejected from the ICS because he failed to attend the riding examination. 1893-1906: Aurobindo worked in the Indian princely state of Baroda as administrative trainee, professor at Baroda College, secretary to the Maharaja of Baroda, and vice-principal of the college. 1902-1910: Aurobindo was active in the Indian freedom movement; he was charged twice with sedition and once with waging war against the government, but was acquitted in all three cases. 1903-1905: Mirra Alfassa (then Mirra Morisset) exhibited paintings at salons in Paris. 1903-1908: Mirra Alfassa was active in the Mouvement Cosmique, a neo-Kabbalah group based in Tlemcen, Algeria, and Paris; during this period she contributed articles to the Revue Cosmique. 1910 (April): Aurobindo sailed to Pondicherry (then part of the French Settlements in India), where he remained for the rest of his life; between 1910 and 1926 an informal group of disciples gathered around him. 1912-1913: Mirra Alfassa (then Mirra Richard) met Sufi leader Hazrat Inayat Khan and Baha’i leader ‘Abdu’l-Baha in Paris. 1914 (March 29): Mirra Alfassa met Aurobindo in Pondicherry; they, along with Mirra’s then husband Paul Richard, launched a monthly journal, Arya, in August. 1915 (February): Mirra and Paul Richard returned to France; Aurobindo brought out the Arya singlehandedly between 1915 and 1921, publishing in it all his major prose works. 1916-1920: Mirra and Paul Richard lived in Japan; in April 1920 they came to Pondicherry; Paul later returned to France. 1916-1950: Aurobindo worked on Savitri , an epic poem in English based on a legend in the Mahabharata. 1926 (November 24): After a major spiritual experience, Aurobindo retired to his rooms, leaving the community of disciples in Mirra’s hands. Viewed retrospectively, this is regarded as the founding date of Sri Aurobindo Ashram. 1927-1938: The ashram grew under the guidance of Mirra (now known as the Mother); Aurobindo (now known as Sri Aurobindo) stayed in touch with his disciples by means of letters. 1938 (November 24): Sri Aurobindo broke his leg while walking in his room; from this point on a group of disciples looked after him. 1942 (December 2): The Mother opened a school for children of disciples. 1947 (August 15): India attained independence on Sri Aurobindo’s seventy-fifth birthday. 1950 (December 5): Sri Aurobindo died. 1950-1958: The Mother gave regular talks to children and members of the ashram, which later were published as Entretiens (Conversations). 1952 (January 6): The Mother inaugurated the Sri Aurobindo University Centre, later renamed Sri Aurobindo International Centre of Education. 1955: Sri Aurobindo Ashram organized legally as Sri Aurobindo Ashram Trust. 1957-1973: The Mother had regular conversations with a disciple concerning her practice of yoga; these talks later were published as L’Agenda de Mère (Mother’s Agenda). 1962 (August 16): Pondicherry became part of the Republic of India. 1968 (February 28): The Mother inaugurated Auroville, an international township situated outside Pondicherry. 1973 (November 17): The Mother died. 1980 (December): The Indian Parliament passed the Auroville (Emergency Provisions) Act, 1980. 1988 (September): The Indian Parliament passed the Auroville Foundation Act, 1988. Aurobindo [Image at right] worked in Baroda from 1893 to 1906. 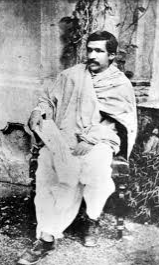 During this period he studied classical and modern Indian literature, wrote a great deal of poetic and prose literature in English, and began to organize physical-culture clubs that he hoped would become the basis of an anti-British revolutionary movement. He took no interest in the Indian National Congress, then a powerless advocacy group, until 1905, when there was a wave of agitation against the government’s proposed partition of the province of Bengal. Going to Calcutta in 1906, he became a leader of the extremist faction of the Indian National Congress and the inspiration of a revolutionary group led by his brother Barindrakumar, which took part in some unsuccessful attempts to assassinate British officials. Arrested in 1908 along with Barindrakumar and other members of the revolutionary group, Aurobindo was charged with conspiring to wage war against the government. After a year-long trial he was acquitted for lack of evidence in May 1909. Aurobindo had begun to practice yoga in 1905, initially to get power to help him in his revolutionary work. Before his arrest and during his imprisonment, he had several transformative spiritual experiences. After a brief return to political action following his release from jail, he withdrew from politics to devote himself fulltime to yoga. Sailing under an assumed name to avoid detainment by the British, he reached Pondicherry, a port in southern India that was then under French control, in April 1910. During the next four years he remained out of sight, absorbed in the practice of yoga, in study, and in writing (Aurobindo 2006; Heehs 2008). Mirra Alfassa’s parents were non-practicing Sephardic Jews who emigrated to Paris from Alexandria, Egypt, in 1877, a year before Mirra was born. Privately educated, she studied art at the Académie Julian and married a painter, Henri Morisset, in 1897. The couple moved in creative circles, getting to know Auguste Rodin, Anatole France, and other artists and writers. They also frequented groups connected with the French occult revival, particularly the Mouvement Cosmique, which was founded by Max Théon (born apparently Eliezer Mordechai Bimstein in Poland around 1850), and his wife (born Mary Ware in England in 1839) in Tlemcen, Algeria, around 1900 (Huss 2015; Heehs 2011). In contrast with the Theosophical Society and other groups that looked for inspiration to a romanticized East, the Mouvement Cosmique held up “the standard of the occidental Tradition.” The basis of its teachings was Lurianic Kabbalah, augmented by the inspirations and occult experiences of Madame Théon. The Mouvement Cosmique had a branch in Paris, and Mirra took part in its activities between 1903 and 1908. During the same period she twice visited Théon and his wife in Tlemcen. In Paris she hosted her own discussion group, called Idéa. At one of its meetings she met the lawyer and writer Paul Richard, who later became her second husband. In 1910, Paul Richard went to Pondicherry to contest the French Indian seat in the Chamber of Deputies. He lost the election, but before returning to Paris met Aurobindo Ghose, with whom he remained in contact. Between 1910 and 1913 he and Mirra met Eastern spiritual teachers, such as Sufi leader Hazrat Inayat Khan and Baha’i leader ‘Abdu’l-Baha, in Paris (Heehs 2008). In 1914, Paul Richard went to Pondicherry again, this time accompanied by Mirra. After failing in his second bid to be elected to the Chamber, Paul proposed that he and Aurobindo publish a philosophical journal in English and French. Aurobindo accepted, and the journal, Arya, was launched in August 1914, the month that World War I broke out. Five months later Paul was mobilized, and he and Mirra returned to France. Paul managed to obtain a post in Japan, and he and Mirra [Image at right] spent the war years there. In the meantime, Aurobindo brought out Arya on his own. In April 1920, Paul and Mirra returned to India. Paul left for France soon afterward; Mirra remained in Pondicherry as a disciple of Aurobindo. There were at this time around a dozen men and women living in Pondicherry as Aurobindo’s disciples. He met them in the evening and spoke with them about various topics, most of them not overtly spiritual. If they showed an interest in spiritual philosophy, he suggested that they read his writings in the Arya. If they said they wanted to practice yoga, he encouraged them to meditate but imposed no fixed routine. Mirra emerged as his foremost disciple, and some of the others began to go to her for guidance. Aurobindo eventually announced that she was his spiritual equal, and when he retired after an important spiritual experience on November 24, 1926, Mirra took over as the active leader of the community, which soon became known as Sri Aurobindo Ashram. (Aurobindo had no love for formal institutions and accepted the name ashram “for want of a better” (Aurobindo 2006)). Around this time Mirra became known as the Mother, while Aurobindo became known as Sri Aurobindo. Between 1927 and 1938 Sri Aurobindo wrote thousands of letters to his disciples, which eventually filled seven large volumes. Mirra meanwhile was overseeing the development of the ashram into a multifaceted spiritual community. Members were expected to work several hours a day in one of ashram’s services (kitchen, laundry, construction and maintenance, etc.). Apart from this there were no mandatory activities. Most disciples practiced meditation and studied the writings and talks of Sri Aurobindo and the Mother. Many also took part in cultural activities, such as writing, painting, and singing. The gurus encouraged each individual to find his or her own path and to establish a personal relationship with the Divine. Most of the disciples’ devotion was directed toward Sri Aurobindo and the Mother themselves. The two gave darshan or public viewing three (later four) times a year, and the Mother presided over collective meditations and other group activities. The ashram grew from around twenty-five members in 1926 to around 150 in 1933. After 1934, people who applied for membership were encouraged to practice where they lived. Some of them formed communities on the model of the ashram, but Sri Aurobindo and the Mother did not assume responsibility for such groups and they made no effort to expand their activities outside Pondicherry. They viewed the ashram as a “laboratory” for the development of a new sort of humanity and felt that mere quantitative growth would not facilitate this process (Aurobindo 2011). 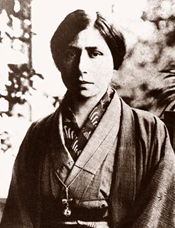 After the outbreak of World War II, Sri Aurobindo and the Mother allowed a number of outside disciples who felt threatened by the approach of the Japanese army to settle in Pondicherry. Some of them brought their children. The Mother opened a school in 1942 and established an innovative program of mental and physical education. She and Sri Aurobindo had never encouraged their disciples to practice hathayoga (postures and breathing exercises). She felt that modern Indians had more need of active forms of exercise, such as athletics, sports and swimming, and she arranged for the construction of a track, tennis courts, basketball courts, and so forth. Soon adult members, and the Mother as well, were taking part in the ashram’s [Image at right] physical education program. Sri Aurobindo had long been in the habit of walking in his room, sometimes for hours at a time. In 1938, he tripped and broke his leg and was confined to his bed for several weeks. At this time a group of disciples was chosen to look after him. For a couple of years he had daily conversations with them: this was the first direct contact he had had with any of his followers since 1926. Around this time, he began to revise and republish the works he had written for the Arya between 1914 and 1921. He also gave attention to Savitri , an epic poem in English that he had begun in 1916. It was published in two volumes in 1950 and 1951. Sri Aurobindo passed away on December 5, 1950 as a result of a kidney infection brought on by enlargement of the prostate. He refused any invasive medical treatment. After his death, the Mother remained in charge of the ashram. In January 1952 she inaugurated the Sri Aurobindo University Centre, later renamed the Sri Aurobindo International Centre of Education, which currently offers classes from kindergarten to college levels. During the 1950s the Mother gave regular talks to students and members of the ashram, sometimes speaking of her own spiritual realizations, which she saw as a continuation of Sri Aurobindo’s efforts to open the way for an evolutionary transformation of life on earth. In the years that followed, she reported progress in her own practice of the yoga of transformation in conversations with a disciple, which later were published as Mother’s Agenda (Mother 1979-1982). In 1968, the Mother inaugurated Auroville, an international community meant to “realize human unity” (Mother 2004). The Mother died on November 17, 1973, at the age of 95. She appointed no successor. A trust that had been set up in 1955 took over the administration of the ashram, which has continued to grow and expand. As of 2016 it consists of around 1,500 fulltime members. Thousands of “devotees” live in the surrounding community and in other Indian and foreign cities. Many frequently visit the ashram and take part in its activities. Devotees and others have organized independent study circles and other Sri Aurobindo- and Mother-related groups in India and abroad. These have no direct relationship with the ashram, which has no branches or any national or international organization. The community of Auroville, which has no legal or administrative relationship with the ashram, was taken over by the Government of India in 1988 to guarantee proper management. (For details see below under Leadership/Organization). The community has continued to develop under the inspiration of Sri Aurobindo and the Mother. At present it has around 2,500 fulltime members, representing more than forty countries (Census – Auroville Population 2016). The Sanskrit word for union is yoga. In philosophy, yoga came to mean a set of teachings and practices found in Patanjali’s Yoga Sutra. More broadly, yoga refers to all practices by which an individual can achieve union with brahman or move in that direction. Conventionally, the methods of yoga are placed in three categories: (1) those that rely on work conceived of as selfless service to the Divine ( karma-yoga or the yoga of action), (2) those that rely on mental exercises such as meditation (jnana-yoga or the yoga of knowledge), (3) those that rely on devotion to ishwara conceived of as a personal god (bhakti-yoga or the yoga of devotion). Some authorities also recognize a fourth category of practices relying on occult forces to bring about personal transformation. In the system known as raja-yoga , this transformation is associated with extraordinary powers or siddhis, as described in the Yoga Sutra. In Sri Aurobindo’s yoga, the transformation comes about through the action of the divine force or shakti, as described in the Tantras. Sri Aurobindo called his system Integral Yoga because it synthesized or integrated the methods of the four traditional paths of yoga, which he called the yoga of divine works, the yoga of integral knowledge, the yoga of divine love, and the yoga of self-perfection. He first used the term “Integral Yoga” in The Synthesis of Yoga in September 1914. (In 1913 he used the Sanskrit equivalent, purna yoga, in an essay.) (Aurobindo 1999; Aurobindo 1997a). In The Synthesis of Yoga he explained that the fundamental principle of yoga was “the turning of one or of all powers of our human consciousness into a means of reaching divine Being.” In the three traditional paths, “one main power of being or one group of its powers is made the means,” while in a synthetic or integral yoga “all powers will be combined and included in the transmuting instrumentation.” The yoga of works, with its main power of will; the yoga of knowledge, with its main power of intellect; and the yoga of devotion, with its main power of love, will be elevated from “the mental into the full spiritual and supramental nature,” paving the way for a “spiritual and gnostic self-perfection” (Aurobindo 1999). Supermind and the supramental are terms that Sri Aurobindo introduced to describe levels of consciousness above the ordinary mind. In his cosmology the “lower hemisphere” is made up of matter, life and mind, while the “higher hemisphere” is made up of being, consciousness and bliss (which are known to Vedanta as sat-chit-ananda ). Between the two hemispheres is supermind, referred to in certain Upanishads as vijnana. Supermind is the dynamic link between the spiritual levels of being-consciousness-bliss and the lower levels of matter-life-mind. Sri Aurobindo viewed the manifestation of the cosmos as a dual process of involution and evolution. Life and mind, which are “involved” in matter, evolve out of it through the intermediary of plant, animal and human life. The supermind, also involved but still latent in matter, is destined to evolve through the intermediary of supramental or gnostic beings. The full emergence of supermind will bring about a transformation of matter, life and mind and inaugurate a divine life in which “gnostic individuals” will interact harmoniously with one another “in a gnostic community or communities.” (Aurobindo 2005). In a yoga diary that he kept between 1912 and 1920 and again in 1927 Sri Aurobindo wrote that he was ascending into various intermediary levels of consciousness between ordinary mind and supermind (Aurobindo 2001). Years later he wrote that the highest of these levels, which he called overmind, had descended into his body in 1926. Thereafter he applied himself to ascending into supermind and to bringing it down into matter. After his death in 1950, the Mother continued this supramental yoga. In 1956, she announced that the supermind had descended into the earth’s atmosphere (Mother 2004). Later she told her disciples that the supermind force was at work in her body to transform it. Sri Aurobindo and the Mother did not encourage their followers to speculate about the descent of the supermind, the physical transformation, and so forth. It was important for them to know that the ultimate goal of yoga was the transformation of individual and collective life and not, as in traditional Vedanta, an escape from samsara , the karma -driven round of birth-and-death. But before individuals could think about rising to the supermind or bringing down its power into their bodies, they had to go through a long and difficult preparation. First comes a preliminary physical and mental purification such as is recommended by virtually all religious and spiritual traditions. There follows the practice of yoga properly speaking, beginning with the triple path of works, knowledge and devotion. In practical terms, the path of works means performing all actions without desire, as described by the Bhagavad Gita. The path of knowledge entails gaining control of the activities of the mind by means of concentration or meditation, while the way of devotion depends on establishing a personal relationship with the Divine or the guru. Many followers of Sri Aurobindo and the Mother look on them as avatars or divine incarnations and direct their devotion to them. While not insisting that they embrace belief in avatarhood, Sri Aurobindo asked his disciples surrender themselves to the Mother and to allow her to guide them from within. Sri Aurobindo took one important term of his philosophy not from the Indian tradition but from the Western esoteric tradition that the Mother had studied before she came to India. This term was the être psychique or “psychic being,” which corresponds roughly to the “divine spark” of the school of Kabbalah developed by Isaac Luria in sixteenth-century Palestine. (The idea of the divine spark also occurs in other spiritual traditions. It is similar to the caitya purusha of medieval Hinduism.) (Heehs 2011). According to Sri Aurobindo, the psychic being preserves the impressions of each individual’s experiences as it passes from one life to another. The embodied human being comprises inner or subtle and outer or gross components. The psychic being is the inmost being, and it is in direct contact with the Divine. An important constituent of the practice of Sri Aurobindo’s yoga is for the individual to establish contact with the psychic being and respond to its inner promptings. In his letters to disciples, Sri Aurobindo specified a number of inner states and attitudes that those who wished to follow his yoga should cultivate. These are the foundations of his sadhana or practice of yoga. Most important is inner peace (shanti) along with a state of freedom from disturbance ( samata ) leading to a positive state of inner cheerfulness (sukham). The sadhaka or practitioner must learn to have faith in the Divine. This is not mental belief, but what is called in Sanskrit shraddha, the soul’s “dynamic entire belief and acceptance” of “the Divine’s existence, wisdom, power, love and grace.” Sadhakas must learn to surrender themselves to the will and guidance of the Divine without insisting on their own preferences and ideas. They should aspire for the Divine’s grace and support, rejecting movements that lead away from the path, such as egoism, desire and anger. Finally, they should be patient, not expecting major results in a few days or even a few decades (Aurobindo 2013). According to Sri Aurobindo and the Mother, the practice of yoga is an individual affair. Each sadhaka ‘s progress is of interest only to him or her, the guru and the Divine. They did not encourage congregational activities, but they did ask sadhakas to work together in harmony, learning how to keep their egos under control. This was the main reason, apart from the maintenance of the ashram’s outward life, that the Mother and assigned work to everyone. On a wider scale, she and Sri Aurobindo looked forward to the establishment of spiritual and, eventually, supramental communities that would be expressions of the Divine in life. They hoped that the ashram would serve as a model for such communities and they viewed the disharmonies of community life as indications of problems that had to be worked out before spiritual and supramental communities could be founded. When the Mother established Auroville in 1968 she intended it to become “a site of material and spiritual researches for a living embodiment of an actual human unity” (Mother 2004). Sri Aurobindo and the Mother did not belong to any religion and therefore did not encourage religious rituals, such as the pujas of popular Hinduism. On the other hand, they accepted that many individuals had a need to give outward expression to their religious or spiritual feelings. Most of their disciples were from Hindu backgrounds, and they allowed them to express their devotion in the traditional Hindu way, for example through pranam or prostration and by attending darshans or public viewings. After Sri Aurobindo’s retirement, the three (later four) yearly darshans were the only occasions when his disciples, and a few selected outsiders, could see him. They passed quietly before him and the Mother, taking a few seconds to make pranam before them. For many years the Mother gave darshan [Image at right] every morning; later only on special occasions. The observance of darshan continued even after the passing of Sri Aurobindo and the Mother. On four special days [the Mother’s birthday (February 21), the day of her final return to Pondicherry (April 24), Sri Aurobindo’s birthday (August 15) and the day of the descent of the overmind in 1926 (November 24)] disciples and visitors pass through the rooms of one or both of them. There is a special darshan every four years to mark the descent of the supermind, which took place on February 29, 1956. During the early years of the ashram, the Mother presided over ceremonial activities that were meant to help the disciples consecrate their lives to the Divine. For a while she used to distribute soup over which she had concentrated in a solemn ceremony. She also led group meditations and presided over group pranam ceremonies. Sri Aurobindo distinguished between such homegrown activities, which had “a living value,” from “old forms which persist although they have no longer any value,” such as the Hindu ceremony of sraddh (offerings to the dead). In a similar way, Christians or Muslims who practiced his yoga might find the forms of prayer they grew up with “either falling off or else [becoming] an obstacle to the free development of their sadhana” (Aurobindo 2011). Sri Aurobindo’s books on yoga, such as The Synthesis of Yoga and Letters on Yoga, are filled with practices that he recommended to followers of his yoga; but he never prescribed a particular technique or set of techniques that everyone must follow. In the Synthesis and in letters he laid down the principles of his path and sketched general lines of practice that each individual could adapt to the circumstances of his or her sadhana under the direction of the outer or inner guru. He accepted, as a basis, the principles of Vedanta (among them brahman, atman, and ishwara) and the practices of the three traditional paths of yoga (karma-yoga, jnana-yoga and bhakti-yoga). To these he added some of the principles and practices of Tantric philosophy and yoga, in particular shakti or the power of the Divine, which is regarded as a creative energy active in the cosmos and the individual. The Integral Yoga, he wrote, “starts from the method of Vedanta to arrive at the aim of the Tantra.” The divine shakti is “the key to the finding of spirit,” and therefore the “initial stress is upon the action of the awakened Shakti in the nervous system of the body and its centres.” This process required a surrender to the Divine and the divine Shakti, whom members of the ashram conceived of in the form of Sri Aurobindo and the Mother. By means of this surrender, “the Divine himself … shall by the light of his presence and guidance perfect the human being in all the forces of the Nature for a divine living.” (1999). Sri Aurobindo in his letters and the Mother in letters and conversations suggested practices that might be helpful to a particular individual: this one should concentrate more on work, that one should do more meditation, and so forth. But the actual course of each individual’s sadhana was left to the direction of the Divine and the Shakti. Through aspiration to them and by contact with the psychic being, the individual would develop the ability to make the right choices in yoga and in life. Since the deaths of Sri Aurobindo and the Mother, members of the ashram and outside disciples have continued to practice yoga along the lines that the two established during their lifetimes. There is a general belief that Sri Aurobindo and the Mother are present to those who aspire to them and that their guidance is available to all who open themselves to it. In addition, their books are available for all who care to read them. In recent years many people in the ashram and Auroville have turned to Sri Aurobindo’s poetic epic Savitri as a source of inspiration and guidance (Aurobindo 1997b). A group based in Auroville disseminates the Mother’s Agenda, which they regard as the key to the yoga of physical transformation. Neither in Auroville nor the ashram are there any mandatory practices or ceremonies, but many ashram members and visitors attend twice-weekly meditations in the ashram playground (where the Mother herself used to give readings and talks) as well as meditations in the ashram’s main building on other days. The four yearly darshans attract thousands of visitors. In Auroville the main focus of yoga is the Matrimandir (literally, temple of the Mother), an innovative meditation hall that was designed according to the Mother’s directions. [Image at right] Special days such as Auroville’s foundation day (February 28) are marked by public observances. During the lifetime of Sri Aurobindo and the Mother, the two of them were accepted by the members of the ashram as spiritual guides and also as directors of the outward life of the community. Asked to write about the legal status of the ashram in 1934, Sri Aurobindo replied that an ashram was simply “the house or houses of a Teacher or Master of spiritual philosophy in which he receives and lodges those who come to him for the teaching and practice.” His ashram could not be considered “a religious association” because its members came “from all religions and some are of no religion.” There was “no creed or set of dogmas, no governing religious body.” The guiding principles were his and the Mother’s teachings, which included “certain psychological practices of concentration and meditation, etc., for the enlarging of the consciousness” (Aurobindo 2006). He regarded the Mother as his spiritual equal and asked members of the ashram to approach him through her. Thus, when disciples wrote letters to Sri Aurobindo they addressed them to the Mother. Unlike Sri Aurobindo, who remained out of sight in his rooms, the Mother interacted with each disciple (particularly when the ashram was relatively small) and oversaw every detail of the ashram’s outward life. She delegated responsibility to heads of departments (gardens, kitchen, construction service, library, printing press, embroidery unit, etc. ), who reported directly to her. Apart from publishing books and journals, Sri Aurobindo and the Mother made no effort to publicize the ashram, did not engage in any sort of proselytism, and turned down the majority of those who wrote asking if they could become members. Neither of them thought that numerical expansion was important. “Nothing depends on the numbers,” Sri Aurobindo wrote in 1934 to a disciple who thought that the numbers attracted to Sri Aurobindo’s yoga would never rival those of the world religions. “The numbers of Buddhism and Christianity were so great because the majority professed it as a creed without its making the least difference to their external life. If the new consciousness were satisfied with that, it could also and much more easily command homage and acceptance by the whole earth. It is because it is a greater consciousness, the Truth-consciousness, that it will insist on a real change” (Aurobindo 2011). They did not establish branch ashrams or assume responsibility over groups that devotees outside the ashram started on their own initiative. When Sri Aurobindo died in 1950, the spiritual and material leadership of the ashram passed seamlessly to the Mother. She continued to run it on established lines, but she did inaugurate a few new organizations, such as the Sri Aurobindo University Centre (later renamed Sri Aurobindo International Centre of Education). In 1955, she reorganized the ashram as a trust in order to guarantee its legal continuity. The first board of Sri Aurobindo Ashram Trust consisted of her and four disciples of her choice. Since her death, replacement members of the board have been chosen by sitting members. As a public charitable trust, the ashram enjoys tax-exempt status in accordance with the terms of Indian law. Most of its funds come through voluntary donations by devotees. The trust oversees several productive departments (cottage industries, publications section, and so forth) that allocate their profits to the ashram. When the Mother conceived of the community that would became Auroville, she entrusted its development to the Sri Aurobindo Society (SAS), a fundraising group founded in Calcutta in 1960, while retaining overall control. A few years after her death, the residents of Auroville came into conflict with the management of the SAS. In 1988, after a period of unrest during which the residents asked the Government of India to intervene, the Indian Parliament passed the Auroville Foundation Act, under which the Government of India assumed administrative control over Auroville (Auroville Foundation Act 1988). Four years later the government vested the assets of Auroville in the Auroville Foundation, which consists of an International Advisory Council, a Governing Board and a Resident’s Assembly. A government-appointed secretary oversees the functioning of the community. The residents are represented by a Working Committee (Auroville Foundation n.d.). Foreign friends of Auroville have organized themselves into Auroville International, a worldwide network that helps fund the community’s projects (Auroville International n.d.). These include a vast reforestation program, attempts to solve the region’s water problems, and joint initiatives with neighboring villages. During the early years of the community that became the ashram, it faced financial and other challenges that stemmed from Sri Aurobindo’s coming to French India as a political refugee. Between 1910 and 1936 British police spied upon him and his companions as a result of his former activities as a revolutionary politician. This unfriendly attention made it difficult for them to move around freely or to receive financial support from friends. The French government tolerated their presence but put limits on the number of houses they could acquire. Pondicherry became part of the Republic of India in 1962. This did not immediately ease the ashram’s financial problems, but by the 1990s it had acquired sufficient resources to provide adequate housing for all its members. Auroville experienced a lean period from 1975 to 1988, when the community was engaged in conflict with the SAS. Since then it has been able to support its members and fund its projects thanks to donations from friends and limited financial assistance from the Government of India. Despite a widespread belief among members of the ashram and Auroville that they and the communities benefit from the spiritual guidance of Sri Aurobindo and the Mother, the lack of explicit directions from embodied gurus has left both communities open to various sorts of disturbance. After the Mother’s death in 1973 the life of the ashram continued in accordance with her and Sri Aurobindo’s teachings and the established customs of the community. Individuals looked within themselves for guidance. Senior sadhakas provided inspiration and advice. Department heads reported to the trustees, who also were obliged to adjudicate conflicts between individuals and to deal with cases of indiscipline. They did their best to make their decisions according to the teachings and the example of Sri Aurobindo and the Mother but did not claim to be acting under their direct guidance. From the mid-1990s, disgruntled ashram members who refused to accept the trustee’s decisions began to form pressure groups and to institute legal cases against the trustees and other members. Many of the cases had to do with practical matters, such as allocation of resources, disciplinary matters, and so forth. Others had to do with questions of belief or sentiment. One cause of dissension was a new edition of Sri Aurobindo’s poem Savitri . Based on a thorough examination of the manuscripts, the new edition (1997) eliminated errors that had crept into the text during the long process of writing, transcription and publication. Some sadhakas were concerned that these corrections constituted changes of an inviolable text, and began to agitate against the editors and the trustees and eventually to institute legal proceedings against them. The case ultimately went before the Supreme Court of India, which decided in favor of the trustees. Another case involved a biography of Sri Aurobindo written by a member of the ashram and published by an American university press. This book was deemed sacrilegious by certain people inside and outside the ashram, who lodged several cases against the book, its author, and the trustees, who were accused of harboring an “unbeliever.” The case against the trustees was dismissed by the Supreme Court in 2016 after five and a half years of hearings. During this period, dissident members formed informal groups to advance their interests, while individuals loyal to the trustees founded groups to support them. The situation led to an unprecedented polarization of the ashram’s community life (Heehs 2015). Though higher courts have always ruled in favor of the ashram, the leaders of dissident groups found that it was relatively easy to institute legal cases, thus undercutting the authority of the trust. Auroville also had to pass through the crucible of legal disputes. In 1975, a group of Auroville residents, troubled by apparent mismanagement by the SAS, registered a new body called the Auroville Residents Association. The SAS filed for a permanent injunction against this group. After several years of inconclusive legal maneuvering, the Government of India intervened. In December 1980 the Indian Parliament passed the Auroville (Emergency Provisions) Act, which authorized a temporary takeover of Auroville by the government. The SAS challenged the act in the courts, saying that Auroville was a religious body and therefore the government had no right to interfere. Two years later the Supreme Court ruled on the matter, saying that Sri Aurobindo and the Mother explicitly denied that their work was religious, and therefore the Auroville Act could stand (Minor 1999; Heehs 2013). Since the passage of the Auroville Foundation Act of 1988, the government has been in direct control of Auroville. 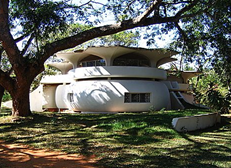 This has prevented the sort of legal challenges that have troubled the ashram after 1997, but has led to fears that the government might treat Auroville as an ordinary government project rather than a spiritual experiment. In fact, government officials have shown a remarkable willingness to let the community develop in its own way. Despite its success in surviving its first forty-eight years relatively unscathed and launching many projects that have enriched the community and the surrounding villages and ecosystem, Auroville has come nowhere near the projected population of 50,000 that the Mother spoke of during the 1960s. It proved impossible for the community to acquire all the land the Mother envisaged as forming the city area and surrounding greenbelt, and speculators have driven land prices up to dizzy levels. The villages around the township have become glitzy tourist traps that stand in sharp contrast to the well-designed, ecologically sound Auroville settlements [Image at right]. Nevertheless both Auroville and the ashram remain dynamic communities that attract visitors from around the world. Image #1: Photograph of Aurobindo Ghose (sitting center) with his parents and siblings in London, 1879. Image #2: Photograph of Aurobindo Ghose as editor of Bande Mataram, a influential nationalist newspaper published in English from Calcutta, 1907. Image #3: Photograph of the Mother in Japan, circa 1916. Image #4: Current photograph of the main building of Sri Aurobindo Ashram. 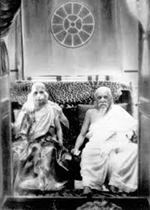 Image #5: Photograph of Sri Aurobindo and the Mother giving darshan, April 1950. Image #7: Photograph of a house in Auroville. Aurobindo, Sri. 2011. Letters on Himself and the Ashram. 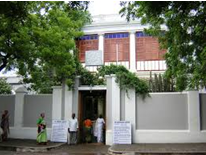 Pondicherry, India: Sri Aurobindo Ashram Publication Department. Aurobindo, Sri. 2006. Autobiographical Notes and Other Writings of Historical Interest. Pondicherry, India: Sri Aurobindo Ashram Publication Department. Aurobindo, Sri. 2005. The Life Divine. Pondicherry, India: Sri Aurobindo Ashram Publication Department. Aurobindo, Sri. 2001. Record of Yoga . Pondicherry, India: Sri Aurobindo Ashram Publication Department. Aurobindo, Sri. 1999. The Synthesis of Yoga. Pondicherry, India: Sri Aurobindo Ashram Publication Department. Aurobindo, Sri. 1997a. Essays Divine and Human: Writings from Manuscripts 1910-1950. Pondicherry, India: Sri Aurobindo Ashram Publication Department. Aurobindo, Sri. 1997. Savitri: A Legend and a Symbol. Pondicherry, India: Sri Aurobindo Ashram Publication Department. Auroville Foundation n.d. Accessed from http://www.auroville.org/contents/572 on 20 May 2016. Auroville International n.d. Accessed from http://www.auroville-international.org/ on 20 May 2016. Census – Auroville Population, January 2016. Accessed from http://www.auroville.org/contents/3329 on 20 May 2016. Heehs, Peter. 2015. The Sri Aurobindo Ashram 1910-2010: An Unfinished History. Nova Religio 19:65-86. Heehs, Peter. 2013. “Not a Question of Theology”? Religions, Religious Institutions and the Courts in India. Comparative Legal History 1:243-61. Heehs, Peter. 2011. “The Kabbalah, the Philosophie Cosmique, and the Integral Yoga: A Study in Cross-Cultural Influence.” Aries 11:219-47. Heehs, Peter. 2008. The Lives of Sri Aurobindo. New York: Columbia University Press. Huss, Boaz. 2015. “Madame Théon, Alta Una, Mother Superior: The Life and Personas of Mary Ware (1839-1908).” Aries 15:210-46. Minor, Robert N. 1999. The Religious, the Spiritual and the Secular: Auroville and Secular India. Albany, NY: SUNY Press. Mother, the (Mirra Alfassa). 2004. Words of the Mother – I. Pondicherry, India: Sri Aurobindo Ashram Publication Department. Mother, the (Mirra Alfassa). 1979-1982. Mother’s Agenda. Thirteen volumes. New York: Institute for Evolutionary Research. Johnson, W.J, trans. 1994. The Bhagavad Gita, Oxford, UK: Oxford University Press. Miller, Barbara Stoller, trans. 1998. Yoga: Discipline of Freedom: The Yoga Sutra Attributed to Patanjali. New York: Bantam Books. Roebuck, Valerie J., trans. 2003. The Upanishads. London: Penguin Books.